Despite what you may see elsewhere, the best way to determine the value of your property is to call or email us. Why? An online calculator pulling inventory on listings that haven't sold just to entice a seller means the information isn't as accurate as the machine might lead you to believe. There is no MLS for DVC resales and we strongly encourage you to consider why a company would mislead you otherwise. The DVC Resale market is ever changing and only a human being can tell you what yesterday's property sold for and why. For the most accurate value, your agent needs to know the resort, the annual allocation, the points banked, borrowed and currently available. Factor in supply and demand coupled with how fast you want the property to sell and DVC by Resale can help you dial in the correct price based on your specific contract. Not through DVC By Resale. We handle everything for you from beginning to end. Complete and return two pages to get started immediately! Do you have more listings than I see on your website? Our website is kept in real time so we don't waste your time. Often properties sell from our newsletter BEFORE they are published at 8pm each night. Unlike others, we don't leave inventory sitting on our website for a long time just to make us look important. Too many "sold" properties distract a buyer from focusing on buying your property. There are no upfront fees, ever. Once the property is sold, DVC by Resale receives a commission on the sale, fully disclosed in our paperwork as with any other real estate transaction. We don't think you'll find a lower rate anywhere else and we are so confident about it, we offer a guarantee! Disney Vacation Club administration charges an estoppel fee for the transfer of ownership currently at $150 per contract. Thanks to our extensive advertising efforts and client base from more than 15 years of Disney point resales, some properties sell in minutes! In 2017, the majority of properties sold within one week when priced accurately for the market. If you aren't in a hurry but prefer to get the most money for your property, we promise not to pressure you to accept less just to brag about it in a blog. At DVC by Resale, it's not about us, it's about you. Ready to Sell? More Questions? 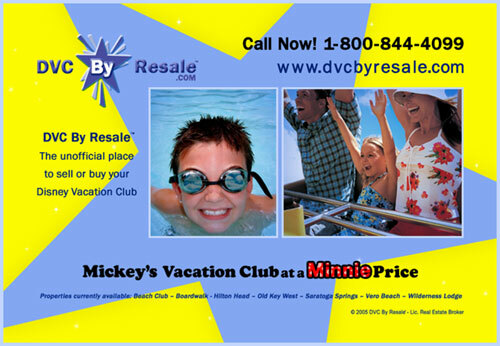 Simply e-mail us at info@dvcbyresale.com 24 hours a day, seven days a week or call us toll free at 1.800.844.4099.